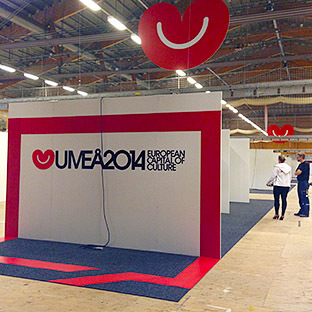 During the Stora Nolia Fair 2013 in Umeå from 3 August to 11 August, Umeå2014 can be found in exhibition hall number 4 at booth numbers 510:01 – 510:56. Get a taste of what will happen during the Capital of Culture year 2014. Come meet the Umeå2014 team and talk to the enthusiasts that will make the Capital of Culture really come alive! The Umeå2014-programme will showcase some of the upcoming activities, giving a taste of the width and quality of next year’s content.